This sterile BALL electrode has a 3/16" shaft allowing it to fit several different types of electrosurgery systems. The ball has a 3mm diameter which allows the user to cauterise tissue superficially and at depth or desiccate tissue using fulgaration. Superficial cautery of small and large areas can be achieved by using either a light touch technique gently brushing the surface or "spotting" the surface for more precise application. Deeper coagulation can be achieved by applying more pressure on the ball / tissue interface this in turn creates greater resistance in the tissues and subsequently develops more heat so that the effect penetrates deeper. The ball electrode can also be used to cauterise vessels cut during dissection. This is done by applying the ball above the vessel opening and pressing down the resulting pressure will staunch some of the flow and the subsequent activation of the electrode with coagulate the remaining seepage and seal the area. (The use of a patient plate during this type of procedure will prevent brittle seals and carbonisation) The ball electrode is also well designed to act as the jumping point in non contact techniques of the spark during fulgaration between the electrode and the tissue creating a spray coagulation and desiccation effect. Disposable, Individually sterile wrapped (see description for more details), Multi-purpose ball electrode. Disposable, Individually sterile wrapped (see description for more details). Multi-purpose ball electrode. This sterile BALL electrode has a 3/16" shaft allowing it to fit several different types of electrosurgery systems. The ball has a 5mm diameter which allows the user to cauterise tissue superficially and at depth or desiccate tissue using fulgaration. Superficial cautery of small and large areas can be achieved by using either a light touch technique gently brushing the surface or "spotting" the surface for more precise application. Deeper coagulation can be achieved by applying more pressure on the ball / tissue interface this in turn creates greater resistance in the tissues and subsequently develops more heat so that the effect penetrates deeper. 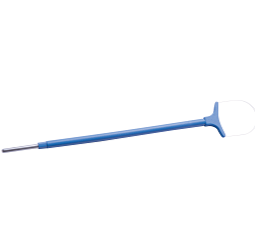 The ball electrode can also be used to cauterise vessels cut during dissection. This is done by applying the ball above the vessel opening and pressing down the resulting pressure will staunch some of the flow and the subsequent activation of the electrode with coagulate the remaining seepage and seal the area. (The use of a patient plate during this type of procedure will prevent brittle seals and carbonisation) The ball electrode is also well designed to act as the jumping point in non contact techniques of the spark during fulgaration between the electrode and the tissue creating a spray coagulation and desiccation effect. Disposable, Individually sterile wrapped (see description for more details), Multi-purpose ball electrode.